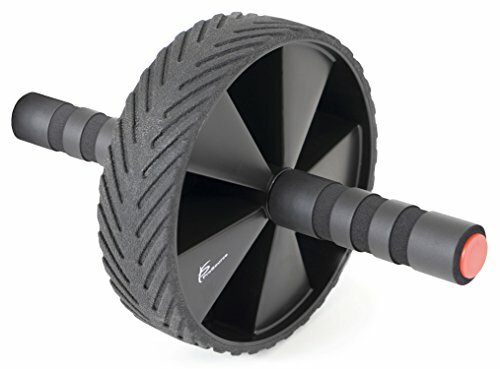 Whether you're shooting to sculpt a six pack, or you need a stronger core for your sport, the ProSource Ab wheel roller is the perfect piece of fitness equipment to get your ABS in shape. This classic Ab workout tool looks simple, but it's incredibly challenging and a quick was to tighten up your tummy. Not only that, but you will also build the muscles in your arms and back as you maneuver the wheel and hold yourself in a balanced position. Our upgraded version of the wheel makes Ab rollouts more comfortable and aids in stability to help you maintain proper form and avoid injury. Cushioned handles with finger grooves provides a comfortable, firm grip to reduce hand fatigue while Rolling. A thick 2-inch rubber wheel with tread gives you superior traction and smooth Rolling. Steel rods and PP plastic offer durability for a fitness tool you can count on to perform workout after workout. The small, compact design makes if great for use at home, the gym, and storing in your car trunk for mobile exercise routines."